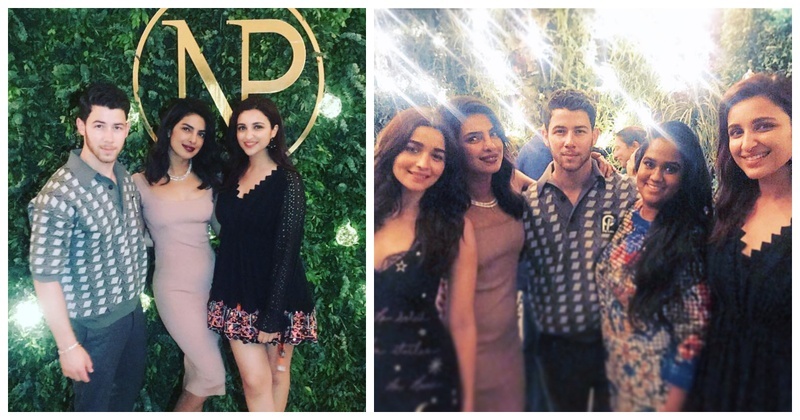 Priyanka Chopra and Nick Jonas' engagement party in Mumbai was attended by all close friends & family! After a roka that left everyone stunned, Priyanka Chopra and Nick Jonas’s engagement bash on Saturday evening was a very private affair, contradictory to what I had in mind. Although, what’s amazing is that the to be married couple seemed to have a great time with their close friends & family and couldn't look happier! Priyanka Chopra danced like there was no tomorrow and seems like that perfect daughter-in-law. The starry night was attended by Alia Bhatt, Mukesh Ambani with wife Nita Ambani and daughter Isha, Sanjay Leela Bhansali, Vishal Bhardwaj, Parineeti Chopra, Salman Khan’s sister Arpita Khan Sharma and her husband Aayush Sharma. Don’t they make an adorable couple? Totally digging her gorgeous silk saree! After a caption that left the whole internet go *awwwww*, Parineeti Chopra stunned everyone in that Hemant and Nandita little black dress giving some major #boho vibes! Seriously in awww with Mama Jonas here in a Gaurav Gupta saree! In another photo shared by the American singer, Nick’s dad can be seen with Priyanka’s uncle. Nick captioned the photo, “Papa Jonas and Bade Papa”. The engagement bash was again a very intimate affair with only the closest of their friends made to the guestlist. Alia Bhatt looked her radiant self in a black maxi dress from Cinq à Sept with a lot of ruffles and a thigh high slit. Totally digging the touch of lace to it! Totally loving how the mother-daughter are twinning in dusty pink! That Valentino dress sure does suits her! Arpita Khan Sharma arrived in a jazzy Dolce Gabbana number which she paired with YSL stilettos! Here’s wishing this much-in love couple a lifetime of togetherness!